Do you struggle the way I do? I’m going to assume it’s a yes, after the response I got from my last post about destressing and refreshing for Christmas. Are you falling into that trap of running around caring for everyone BUT yourself? 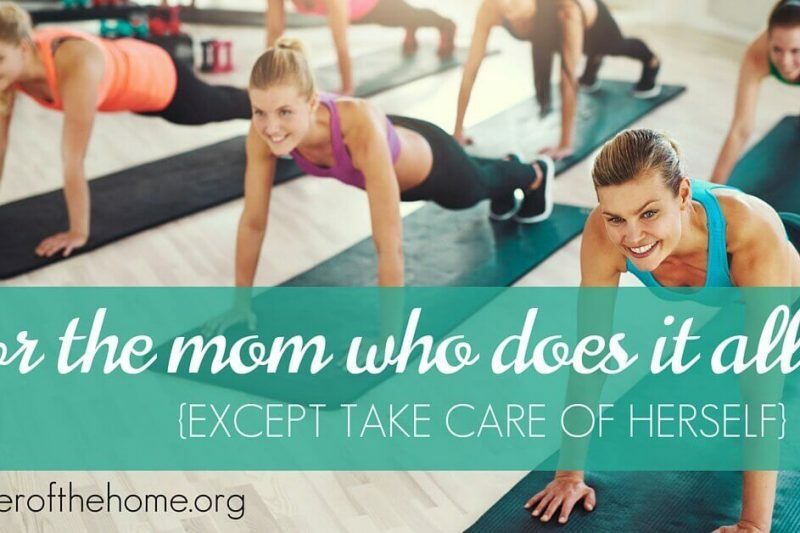 Are you the mom who feels like all she does is feed people, change diapers, and manage the cleaning? 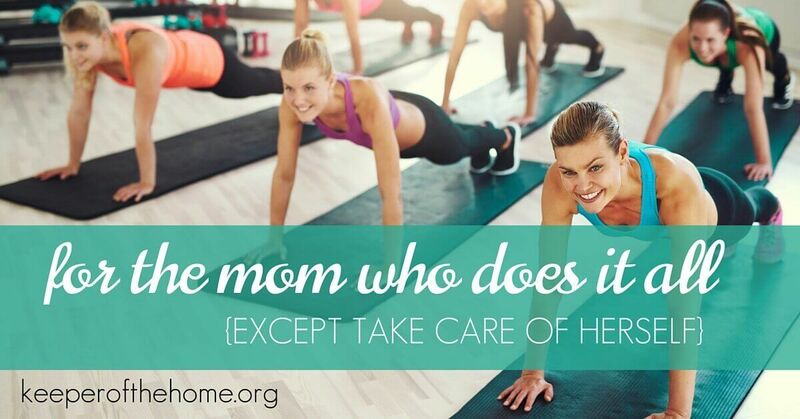 Or are you the mom who spends all of her extra time on homeschool plans or even has teens whose schoolwork requires you to learn the material before trying to teach or help them with theirs? Maybe you have kids in public or private school and your days are spent at work or keeping the home all day and then as soon as you get off you are the resident taxi driver. Over the last 17 years, I have been each of those moms at some point. Some years I’m on it: I eat whole, exercise, and really take good care of myself and then feel great, ready to conquer the world. Then there are the years where I’m terrible at taking care of myself. It’s all I can do to keep up with the demands of the day and then get up the next morning. This year was one of horrible proportions for me. For one thing, I put on 20 pounds. Yep. 20. In one year. It was a shock. Suddenly I realized I wasn’t tending to myself and I was becoming a bear. Getting everything done started to become the least of my worries as my kids started to ask, “Mom, what’s wrong with you”? and I repeatedly heard, “You’re no fun anymore”! As I started to notice the weight gain I quickly tried hard to lose the weight, but nothing worked. I had neglected myself for so long that I had nearly made myself sick. And it was showing in more ways than one! Most of my adult life I have been pretty fit. Maybe I wasn’t trying hard enough? I was so busy; maybe it was just stress? So I started trying harder…only to gain more. I did all the things I would do during my good years when I had been uber healthy and fit. I consumed a healthy, raw diet, then a paleo diet, and after a while a gluten free diet, drank plenty of water, and I tried one fast after another. I would lose 5 or 10 pounds and then a week later the weight was right back on me. I began to notice my fingernails were getting brittle and breaking way more than usual. My hair started to thin, coming out in clumps and what was left was rough and hard to brush. It was brittle too and broke easily, resulting in much shorter hair than I like, and I was unable to grow it out. It stuck out everywhere, leaving me with a ’do that left much to be desired. And then it was so hard to get up in the morning and by the afternoon I needed a snack and a nap (like I had time for that) to be able to handle the kids when they came home from school. Worse, I was exhausted and ready for bed by 8:30. Remember that post I did about coffee a while back? Yep that was going on too. Talk about crabby! Short tempered! No fun! This went on for months before I finally gave in and made the decision that I had to do something. I had to get help. But to be honest, picking up that phone to make an appointment for myself, when I knew I had orthodontist appointments and sporting events planned for the kids, was the hardest thing to do. I really had to convince myself that one appointment for myself was OK.
Mamas, you are a person too…someone who needs cared for and looked after. The hard part is that YOU are the one that has to look after yourself all the while looking after all your little booger monsters and that big handsome hunk-of-love that is your husband. They can’t do it for you. What happens when they notice when you are not your best? That is when you clue in and say OK, I’ll go look after myself for a bit so I can take better care of you! My first step was that phone call. Somehow the needle they stuck in my arm to draw my blood was easier to take than the time I gave myself to be there. I have that hypothyroid condition that so many of you suffer with, making you tired and sluggish. You know, it causes that brain fog that makes us forget what we were doing! A healthy high fat, high protein diet, plus a daily supplement of fish oil or flaxseed oil, have made a huge difference for me in my ability to think things through and remember where I put my cell phone! Vitamin D symptoms can mimic thyroid conditions. I had a double whammy: I found out that when I moved to a northern state that I completely depleted my vitamin D stores. Per doctors orders, I’ve been taking 5000 iu two times per day to build it back up. And, get this: most people are vitamin D deficient! I have been reading Dark Deception and it has helped me understand vitamin D deficiency and why it is such an epidemic. Plus, it includes ways to make sure I get the vitamin D I need to stay healthy….watch for a book review in the future. I spent the last few months building up my vitamin tanks and I no longer feel so exhausted. In fact I am sometimes the last one to bed, even after those long talks at night with my teenagers! I took a break from heavy workouts, to give my body time to recover from the damage I did by pushing myself too hard. Interestingly, I quit gaining weight and just stabilized even though I quit working out and let my body rest. But now that my tanks are full, I’m ready to tackle the new year. I have a lot to learn still about my thyroid and the importance of Vitamin D. I’m going to start the new year by reviewing my health goals, making clear plans to achieve my goals for the new year and get the encouragement I need for a do-over. I need a community of women. Moms, women who are on this roller coaster of a journey with me and understand what I am going through and what I need to get through it. 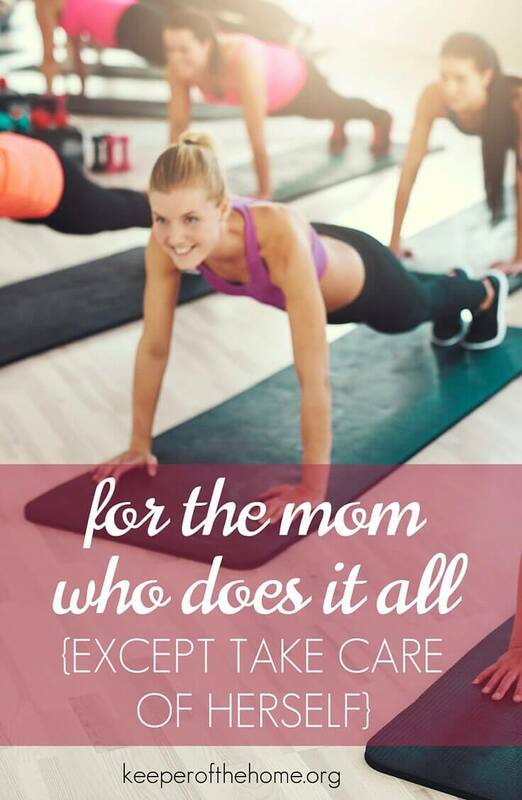 I used to love going to the gym and working out with other women, sharing in the battles of womanhood, commiserating and encouraging each other. 😉 Now I live too far away and its just not feasible for me to drive and pay a monthly fee, so I have decided to take on my battle at home. The problem? No community of women, unless you count the dog and cat. But I do have you and other healthy living blogs to interact with and find that support and encouragement I need and for that I am so very grateful! Join me with your own health goals. What are your health goals for the new year? Raising healthy eaters- What's for lunch, Mom? Weekend Links & Life as Mom sale!